How does my sponsorship help a child? Many of the children in our Hope Projects were in such vulnerable situations that immediate intervention was the difference between life and death. The moment a child is brought into one of our Hope Projects PHW will provide more than just the basics. It is through sponsorship that the children are provided an opportunity for a future with endless possibilities. We provide complete care in these five areas of a child’s life: food/water, an education, medical care, shelter/security and spiritual/character mentorship. How many sponsors support my child? Each child requires $190 per month to be fully sponsored. Sponsorship levels vary and PHW will partner sponsors together until a child’s financial needs are fully met. Once the full sponsorship is met the child will no longer be available for sponsorship. What is the duration of my sponsorship? Sponsors are encouraged to view their sponsorship as a spiritual adoption of their child, treating and regarding them as one of their own. Therefore, child sponsorship through PHW is considered perpetual until your sponsored child graduates from our program or you choose to discontinue your sponsorship. What should I expect as a child sponsor? New child sponsor will receive a Sponsorship Kit in the mail that will include a welcome letter from PHW, the profile and photograph of your sponsored child and a special gift. With your sponsorship you will receive quarterly communications and photographs of your sponsored child. Sponsors are not required to but are strongly encouraged to communicate with their child, here is how you can get plugged in. E-mail – Simply write your child at letters@projecthopeworldwide.org. A PHW staff member will screen and direct your communication to your sponsored child. What should I write or send to my sponsored child? Send an introductory letter telling your sponsored child about you, your family and your life. Your sponsored child will love to hear all about you and see photographs of you and your family. Keep in mind that your sponsored child likely does not have many personal possessions and will not understand or be able to relate to new purchases or material possession. Gifts such as coloring books, reading books, stickers, jump ropes and small toys are always welcome. Part of what makes PHW’s sponsorship program unique is the ability to travel to our Hope Projects and meet your sponsored child. Team Trip dates are posted on www.projecthopeworldwide.org/trips. Simply enter your information and a PHW staff member will contact you about our Team Trips. How is my child sponsorship allocated? PHW’s 100% guarantee means that all money contributed towards a child sponsorship will be allocated for the holistic care of the orphans in our Hope Projects. Is my child sponsorship tax deductible? Yes, Project Hope Worldwide is a 501(c)(3) non-profit organization (Tax ID 27-1873580). Your Partnership is 100% tax deductible and you will receive a tax statement in January each year. 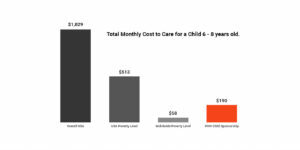 Why does it take $190 per month to provide holistic care for each child? Let us put our sponsorship cost into perspective. Since 1960, the U.S. Department of Agriculture has provided estimates of expenditures on children from birth through age 17. For the United States, the 2015 annual child rearing expense was estimated at $12,350 or $1029 per month. The Department of Health and Human Services for 2017 estimated the annual child rearing expense for poverty level in the U.S. at $6,150 or $513 per month. In October 2015 the World Bank defined the new international absolute poverty line at $1.90 a day or $58 per month. You can see from the chart that PHW’s child sponsorship costs are above the Worldwide Absolute Poverty Level, well below the US Federal Poverty Level, and significantly below the cost for a typical U.S. family. We do not want our PHW kids living at the poverty level. We want their lives to be a delight; for them to have the opportunity to flourish like our own children. At PHW we believe that excellence honors God and inspires people. Therefore, we seek a paradigm shift away from “enough” to “excellence” that helps us view the orphaned and vulnerable children as God sees them and in the same way we view our own children…. as unique children with special God-given gifts and talents to be nurtured and developed to become all He created them to be. The prevailing paradigm in our world today views orphans and vulnerable children as second-rate humans who somehow don’t need and deserve the same level of love and care as children in stable families and/or socioeconomic classes – they aren’t “our own” – so why should they get anything more than leftovers. When we provide only the basic needs, the children often are undereducated and given bare-bones medical attention, nutrition, and other care. They are given no opportunity to develop their unique, God-given sets of skills and talents. Instead, they are oppressed and abused directly and indirectly (through neglect and apathy), every day of their lives. At PHW excellence has at its center someone who is willing to care for our orphans and vulnerable children as if they are their own. PHW has been operating since 2009 and we have a detailed history of expenses for what it takes to provide excellent holistic care for each child. Your participation at whatever level you choose is always appreciated; whether as a Partner Sponsor or a Sole Sponsor. PHW thrives through the hearts of people like you who want to maximize the impact of their lives and leave an eternal legacy by providing a living illustration of the gospel thru the care of orphans and vulnerable children throughout the world.